Have you considered, after 3…Kf3, say 4. Kd2 Ke4 5. f6! Kf5 6. Ke3 Kxf6 7. Kf4 draw. Or similarly if 4… f6 5.Kd3 Kf4 6. Ke2 Kxf5 6. Kf3. 1…Rf1+ looks a better way to liquidate with gain of tempo. After 3…Kf3, have you considered, eg. 4.Kd2. Or similarly, if 4…f6 5. Kd3 Kf4 6. Ke2 Kxf5 7. Kf3. 1…Rf1+! looks like a better way to liquidate with gain of tempo. and then chaperone the Black Pawn until Queened. I’m interested in your source for this. Jim Stevenson showed me this position today. I searched in ChessBase and it came up, not with Maia, but with Sidney Bernstein – Arthur Dake US Championship 1936. Gratifyingly, Dake made the same mistake as I did and only drew a game he should have won. 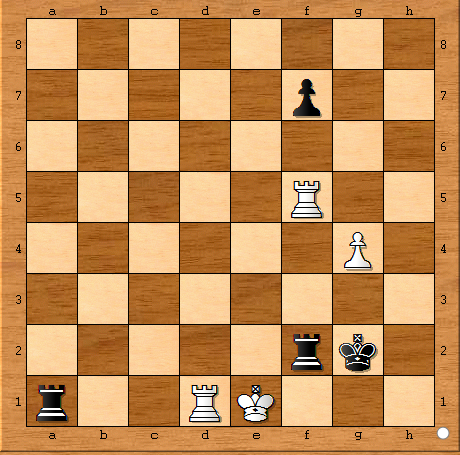 The game is online at http://www.chessgames.com/perl/chessgame?gid=1145205. Thanks – I see what you’re doing now. Jim and I had both misunderstood the attribution. Puzzle of the week is a great idea: I’ll have to add this feature to the Richmond website. Looking forward to seeing you in ThamesValleyLeagueLand shortly. Previous Previous post: 2018-19 Fixtures are OUT!